Stuffed mushrooms are a huge hit at every party. They are versatile, easy to make and a delicious finger food. 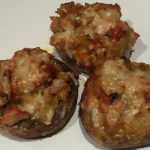 Stuffed mushrooms packed full of veggies, spices and Parmesan cheese. 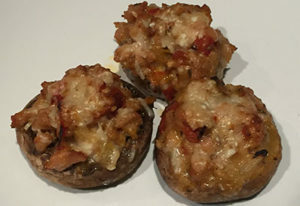 Most stuffed mushrooms are filled with a sausage and cream cheese base. Although those mushrooms are scrumptious, the amount of calories that packed in each mushroom limits your ability to eat several. This recipe takes a different twist on the typical stuffed mushrooms. They are filled with veggies, spices and a little bit of Parmesan cheese. The cheese acts as a binder and helps keep the filling together. However, if you are dairy free or vegan, you can omit the cheese. Cook the mushroom caps face side down until the liquid begins to drain. Then soak up any additional liquid by draining them on a paper towel. The secret to making the perfect stuffed mushroom is to bake the mushrooms first to drain off some of the liquid. If you skip this step, you mushrooms will be too moist and the filling will have a difficult time staying inside the cap. Baking them prior to filling also allows the veggies to not become overcooked and mushy. Stuffed mushrooms are the favorite for any get-together. No need for breadcrumbs in this delicious recipe! Place the mushrooms stem side down on a baking sheet and bake until the liquid leaks out of them. 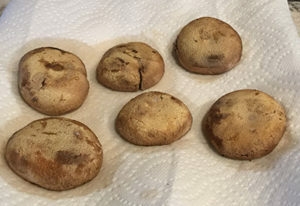 Remove from the oven and place the mushrooms stem side down on paper towels to drain. Chop half of the mushroom stems along with the onion, green onions, red bell pepper, roasted pepper and parsley into tiny pieces. Heat olive oil in a skillet. Add the mushrooms stems, red pepper, roasted pepper, green onion and onion to the skillet and sauté. Add the oregano and salt and pepper. Saute for about 5 minutes until pepper and onion are tender. Transfer the stuffing to a bowl and let it cool a bit. Add the parsley and Parmesan cheese and mix well. Place the mushrooms stem side up on the baking sheet and fill them with the stuffing. Sprinkle additional Parmesan cheese on top as desired. ← No Bake Quinoa Bites – A Healthy and Delicious Snack or Dessert!